Microbeads are the little bits of plastic found in some facial scrubs, toothpastes, hand sanitizers and other personal care products that claim to help exfoliate by scrubbing away dirt more effectively. But to scientists and environmentalists, these plastic bits are hurting fish and wildlife and may even be damaging human health. You've probably seen commercials featuring the use of microbeads and you may have used them yourself. They are the little bits of plastic found in some facial scrubs, toothpastes, hand sanitizers and other personal care products that claim to help exfoliate by scrubbing away dirt more effectively. But to scientists and environmentalists, these plastic pebbles are hurting fish, wildlife and may even be damaging human health. Microbeads are not harmful when used directly, but issues arise once they are washed down the drain. They are so small that they can make it through most water treatment plants that don't have filter systems designed to catch minuscule particles. The plastic fragments then make their way into lakes, rivers and streams, where they can be ingested by water-dwelling organisms such as fish. Those environmental concerns have led Loblaw Companies Ltd. to voluntarily announce that it will stop making products with microbeads by 2018 as momentum continues to mount for a complete ban. "The concern is that these microbeads then make it up the food chain," said Philippe Van Cappellen, an ecohydrology professor at the University of Waterloo, who spoke to CBC's The Morning Edition in March. 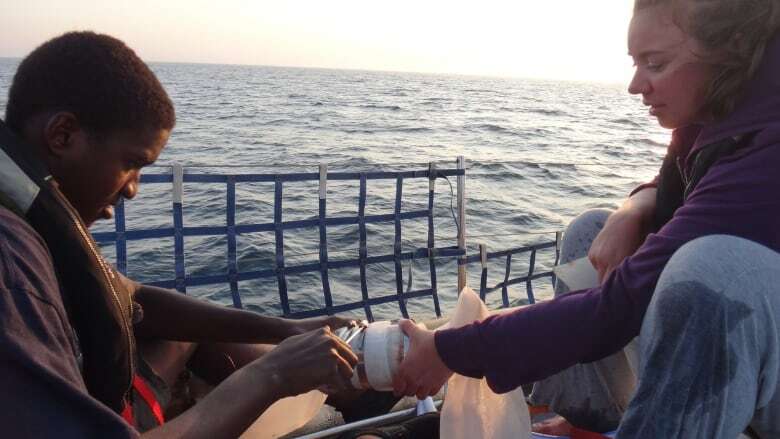 "Since they're so small, they also have a large surface relative to their mass and certain contaminants that are present in the environment can actually preferentially accumulate on those microbeads." Synthetic chemical compounds such as polychlorinated biphenyls and polycyclic aromatic hydrocarbons can accumulate on the plastic bits, according to Van Cappellen. "Those are compounds that are known — or at least have been suggested — to be causing cancer or birth defects and those are contaminants that preferentially will accumulate on the surfaces on these little plastic particles." Research shows that microplastics, including microbeads, carry these contaminants along the food chain, potentially allowing humans to consume them in food and water, Van Cappellen said. If a fish eats the plastic and someone eats the fish, the risk of being affected by these cancer-causing contaminants is real. Scientists don't have direct evidence that microbeads pose a direct health problem for humans, but the concern is there, Van Cappellen says. The potential danger is why environmentalists in Illinois successfully pushed for a ban on plastic microbeads in personal care products in 2014. It's also why U.S. House Rep. Frank Pallone introduced a bill to ban the products south of the border by 2018. In Canada, Mayor Keith Hobbs of Thunder Bay, Ont., said the presence of microbeads in the Great Lakes is a "huge issue." "We've had this on our radar for a few years now and ... we do discuss it at length [at] just about every meeting we have," he said in February. A month after his comments, the House of Commons unanimously passed an NDP motion calling for Ottawa to add microbeads to the list of potentially toxic substances. The Conservative government said Environment Canada would study the dangers posed to wildlife and the environment by microbeads, and the findings would determine a federal-provincial action plan. "The chemical management plan brought forth by our government will prioritize microbeads for assessment, which will benefit all Canadians," Colin Carrie, the parliamentary secretary to the environment minister, said in March. But NDP environment critic Megan Leslie, who introduced the March motion, said the government is not acting fast enough. "The Conservatives promised to tackle this pollution problem; but nothing concrete has been undertaken to act on the unanimous will of the House," she said in a May statement. "We want concrete action, now." 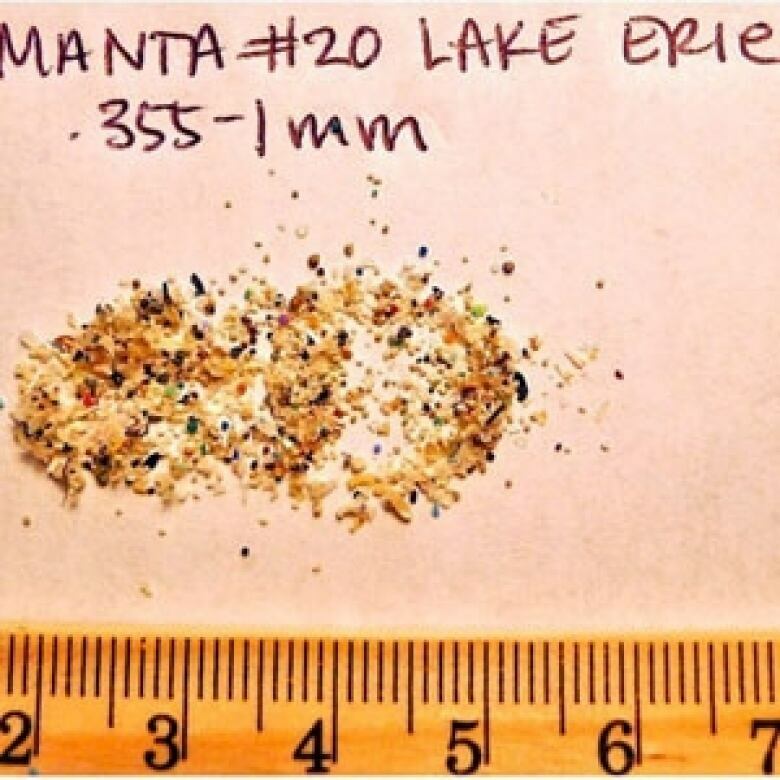 The NDP's critic for the Great Lakes, Brian Masse, said Canada should follow the example of other countries and eliminate microbeads from everyday consumer products altogether. The government said Thursday the review that is underway is evidence that it is taking the issue seriously. "The motion called for taking immediate measures, and that's exactly what our government is doing, " said Shane Buckingham, press secretary for Environment Minister Leona Aglukkaq, in an email to CBC News. "Environment Canada has initiated a scientific review to assess the effects of microbeads on the environment." In May, Liberal environment critic John McKay introduced a private member's bill to ban the sale of personal care products that contain microbeads. He said his bill would "prevent some manufacturers from gaining an unfair advantage over companies that are showing leadership and phasing out this environmentally harmful ingredient." There has also been a public petition posted on change.org urging Environment Canada to ban microbeads.